Manufacturing and Trading of Precision Brass Components. Being a reputed exports company, we have made this sure for our company that all the requirements are well completed before any lapse or shortage. We respond favorably to the increasing foreign inquiries and are expected to step up our production process further. Our R&D department is also being expanded for the inclusion of more and better micro-processor controlled machine range. In export business, we are expected to deliver the products in a safe and sophisticated packaging ensuring the quality of the products and we have been successful in doing so. Thus winning the trust of the customers. We have developed for ourselves a sophisticated and state of the art infrastructure that has been the back bone of our organization processes. In our infrastructure we have various kinds of units that help us in continuing to develop our manufactured range of brass fittings. We also being the exporters of the same have to give a safe and sound packaging to the products. Our exporting network being highly expanded helps us in meeting to the needs of our sprawled client base. Manufactured as per the international standards laid by different industries, the offered range of our brass products has been in wide demand. 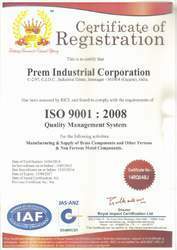 Being a quality committed company, we make sure that the products are also cost effective. The raw material that we incorporate in the making is efficient enough in making a completely efficient and durable range that can be relied upon. Our focus on the specialized manufacturing has helped us offer a certified range of these different kinds of brass fittings. We are also eligible in offering cost effective solutions to our esteemed clients in reference to the fittings and their installations. In order to keep the consistency of the production process firm and high in quality levels, we each team for every particular process of ours. We have hired for ourselves the best in the industry professionals, who have given complete attention to the workphase alloted to them respectively. In our team we have members such as the manufacturing experts, packaging personnels, warehousing personnels, project managers, skilled and semi skilled workers. Following an organized pattern of working, our team members work in complete coordination for attaining the organizational goals and availing the customers their required products. 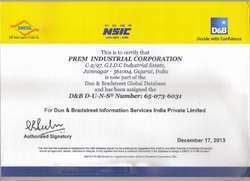 Our company has D&B certification.